Classic, avant-garde, stunning solo performances – trips to Dublin are never complete without at least one evening’s theatrical performance and if the last few days are anything to go by, there is tremendous variety to choose from. If it’s nostalgia you seek, look no farther than ‘the Grand Old Lady’ – The Gaiety on South King Street, close to St. Stephen’s Green. Opened in 1871, this sumptuously decorated theater with plush seating and ornate frescoes has been home to Ireland’s greatest playwrights and actors for generations. 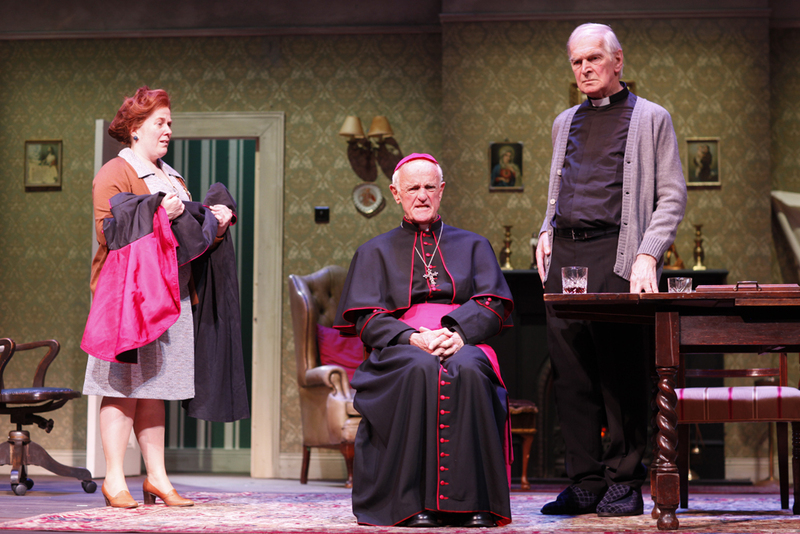 Right now it is honoring one of the nation’s most prominent writers, John B. Keane, by hosting his satirical work ‘Moll,’ courtesy of Verdant Productions Ltd. focusing on the lives of three conniving priests and their even more conniving housekeeper. Shocking revelations recently about the Catholic church’s skullduggery in Ireland and its abuse of public trust helps this play maintain its timeliness and social relevance and it is with bittersweet amusement we learn just how much of its ‘public service’ focuses around the collection of money and how much of that contributes to the preservation of priestly comforts and prestige. Though it is still open to question whether Keane intended any serious social commentary. 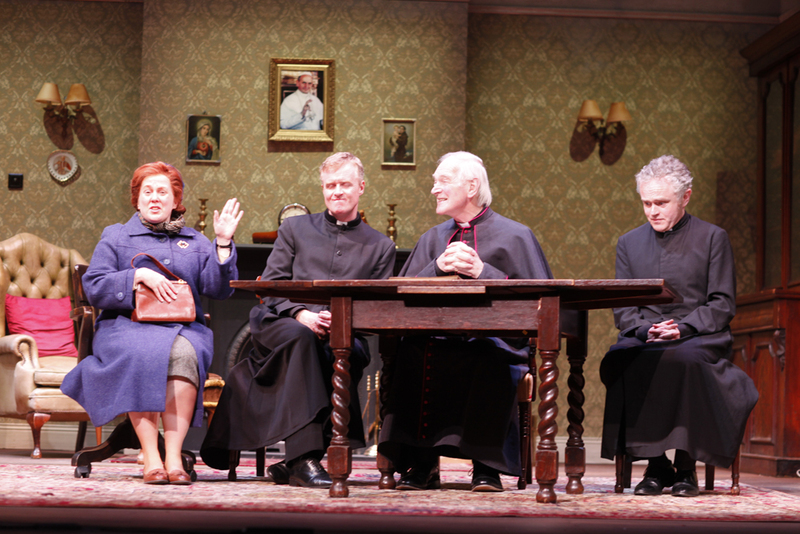 The play opens with three priests sitting at a table despondent at having to embark on a search for a new housekeeper. Ultimately, what they end up with in Moll, played wonderfully by Clare Barrett, is more than they bargain for. The wily woman manipulates their daily lives until she not only has them cleaning, dusting and clearing up cutlery but also makes a few pennies on the side via commissions on what is known within Catholic circles as “the Mass card business,’ selling prayer cards signed by priests for a considerable profit on special occasions such as illness and deaths. A witty scene even has the two curates waving wilted sausages and dried peas in the air complaining about the quality of their breakfasts. The play, a witty satire on the underlying hypocrisy of churchly matters, provides an amusing and entertaining evening, pitting the wits of one wily woman against three spoiled and gullible priests, causing one of them, Father Brest, the most colorful of the trio played delightfully by Damian Kearney, to compare her dictatorial inclinations to those of Hitler and Stalin. 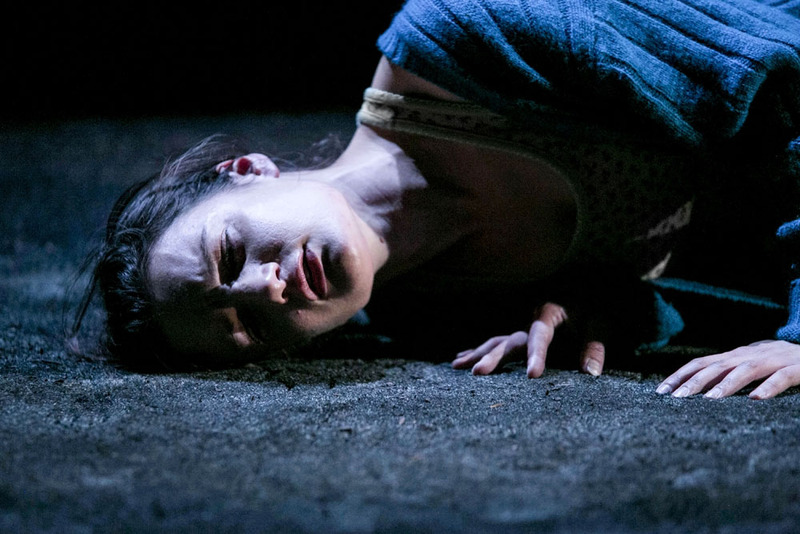 ‘Mesmerising’ is the best adjective to describe Aoife Duffin’s impassioned solo performance of the stage adaptation of “A Girl’s A Half-formed Thing,’ the debut novel by Eimear McBride. 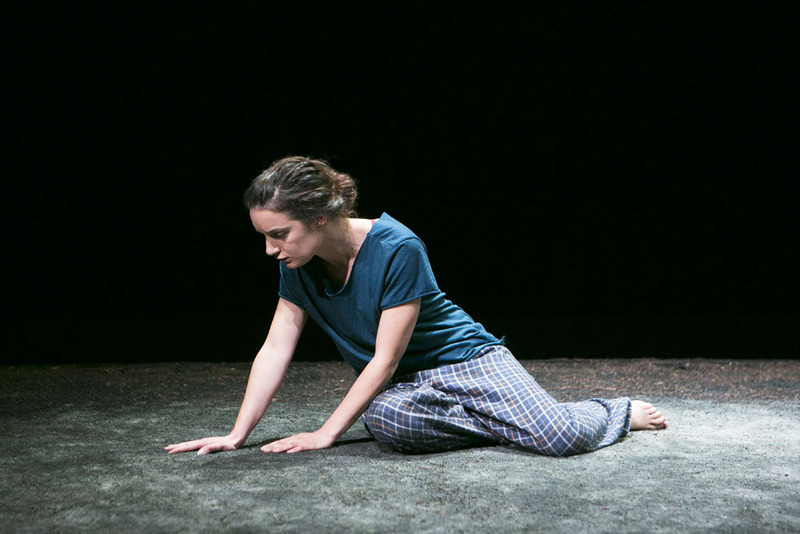 On a bare, black stage at the Project Arts Center and dressed only in T-shirt and pajama pants, the Trinity college trained actress gives a riveting performance combining multiple voices, streams of guttural sound and body movement that drag the audience down into the dark, soiled world of a young girl trying to deal with sexual abuse. This entertainment is not for the faint-hearted. It is both depressing and heartbreaking as well as emotionally draining, both for audience and performer (I could swear Aoife had real tears in her eyes at the end of what must have been a grueling 80-minute stint without a break). In many ways, the play draws back the curtain of hypocritical Ireland – with religion, family and sexual abuse dominating themes throughout. The girl’s narrative (the main character is never named) is a harrowing monologue tracing her life from birth to adulthood and how her uncle’s actions besmirch her view of the world leaving only her innocent reminisces of childhood with her young, sick brother providing token relief from the harsh adult world she endures. At best, this is an uncomfortable journey inside the mind of a young, vulnerable and isolated girl trying to come to terms with the unthinkable leading to a spiral of hopelessness and chaotic sexuality. Yet for all her suffering and while Girl remains damaged, she is also defiant, especially in the scene when she stonily humiliates her uncle by confronting him directly with his heinous crime. Composer and sound designer, Mel Mercier, provides unsettlingly eerie background music whose tone matches the protagonist’s intense inner struggles while Lian Bell’s sparse stage design emphasizes the stark barrenness of Girl’s life. 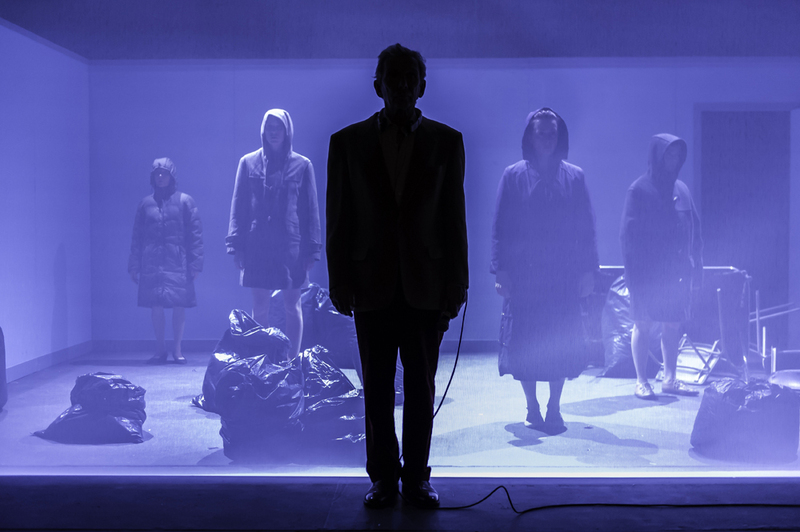 In ‘Lippy’ at the Peacock Theatre, writer Bush Moukarzel takes the strange case of four women who starved themselves to death in Leixlip, a Dublin suburb, and creates a challenging piece of ‘integrated theatre’ combining music, dialogue, video, movie clips, dance and special effects. In an innovative approach that turns standard theater on its head, the play begins with a simulated ‘post-show’ chat with the director interviewing one of the actors. The latter turns out to be a lip-reader who has helped police in this particular investigation. But when he demonstrates his skill on-stage, he is shown to misinterpret many of the interviewer’s words thus hinting at the obscurity and communicative confusions that are to follow. In effect, “Lippy” focuses less on the four deaths than on our inability to understand clearly what happened to them. Even the projection of visual aids, including YouTube and movie clips (including ‘The Godfather’ and ‘2001: A Space Odyssey’), is muddied by imperfect technology. The disconcerting opening segues into a series of ever more disconcerting scenes. Four hulking shadows materialize and pluck floating black bags from the air. Are these the bodies of the dead women? Or their souls? They then reappear as figures in Hazmat suits in a stark and shabby room and draw chalk outlines on the wall as if recreating the crime scene. But then the four suited figures step out of their gear to reveal themselves as the four soon-to-die solemn women as played by Joanna Banks, Caitriona Ni Mhurchu, Liv O’Donoghue and Eileen Walsh. 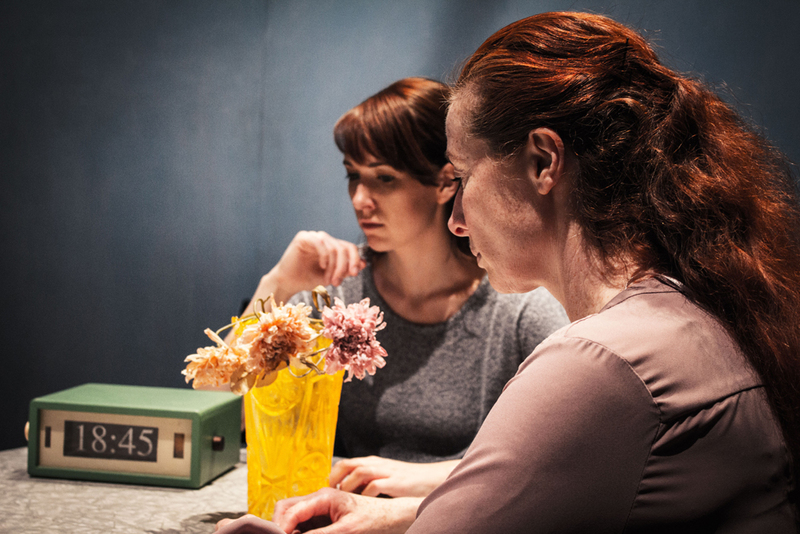 Overall, this edgy production from the Dublin-based Dead Centre company offers a multilayered, multiform examination of the real-life suicide pact of three sisters and their aunt, who in 2000 died by voluntary starvation in the house they shared. If anything, the fog of confusion just keeps thickening as the play goes on, taunting our ultimate lack of understanding of what drove the women to suicide but also of the lives of others around us. The performance features ingeniously choreographed sequences including a slow-motion ballet that eerily evokes the death throes of the four women. Adding an even more opaque layer to a tantalizing theatrical experience, the play ends with a video close-up of a woman’s lips and a monologue written by playwright Mark O’Halloran. Posted in Arts & EntertainmentTagged A Girl is a Half-formed thing, Abbey Theater, actors, Aoife Duffiin, bingo, Caitriona Ni Mhurchu, Catholic Church, Clare Barrett, Damian Kearney, Dead Centre company, Dublin, Eileen Walsh, Eimear McBride, entertainment, Gaiety, Hitler, Ireland, Joanna Banks, John B. Keane, Lippy, Liv O’Donoghue, Mark O’Halloran, mass card, Mel Mercier, Moll, Peacock Theatre, play, playwrights, priest, Project Arts Centre, sexual abuse, stage, Stalin, theatre, Trinity College, Verdant ProductionsBookmark the permalink.